What is the Global Dimension? 20th March, is the vernal equinox, heralding the start of spring in the northern hemisphere. The EarthSky website explains this more fully, with everything you need to know: Vernal or spring equinox. Science: The equinox; balancing eggs…! Eggs feature quite a lot in spring celebrations – think of Easter eggs, for example. They’re a pretty obvious fertility symbol, fitting in very well with spring being the start of the growing season as the weather warms up. One ‘cheating’ option is to sprinkle some salt under the egg before trying to balance it. Salt crystals are tiny cubes, so they can help the egg stay steady! There are many traditions of decorating eggs – take a look at this slideshow of wonderful examples from Central and Eastern Europe. You can find a range of creative egg-decorating ideas in this Guardian article. You could also try making cascarones – eggs filled with confetti that you ‘smash’ on people’s heads (so no sticky mess, just lots of paper to clear up). This is a tradition that’s wandered from China, to Italy and Spain then to Mexico and the southern USA. With spring cleaning we make a fresh, clean start inside as things start to grow outside. Hopefully the weather is warm enough for us to open a few windows and let the fresh air in to blow away any dust and cobwebs (both literally and metaphorically). The following traditions all connect loosely to this idea. The Buergbrennen in Luxembourg is one ancient tradition. 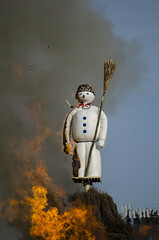 There’s also the Burning of the Böögg (a ‘bogeyman’, in the form of a snowman stuffed with fireworks) in the Swiss town of Zurich. The moment the Böögg’s head explodes marks the end of winter, and the quicker this happens, the longer and hotter the summer will be! A more recent ‘tradition’ is Burning Away the Winter Blues in Whitehorse, Yukon, Canada, begun by an education theatre company 14 years ago. This blog explains how they make an effigy of wintry blues and ceremonially burn it. What kind of winter effigy would your pupils make? In Poland and some other Eastern European countries the Monday after Easter is known as Wet Monday. The tradition is for young people to throw or squirt water at each other. In particular, the boys take aim at the girls they like… the girl that gets the most drenched is therefore thought to be the most attractive! Thailand has celebratory water fights as well, during their Songkran Festival, which falls in mid April. Whereas in India they fight with coloured powder on Holi. 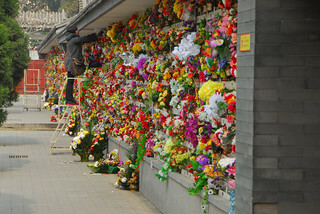 In Chinese culture the Qingming Festival in early April is a day for ‘tomb sweeping’ – visiting, cleaning and planting new flowers on the graves of your ancestors to pay respect. In Jewish culture, there is a tradition of thoroughly cleaning the house before Passover to remove all traces of chametz (“leaven”, including yeast and crumbs of bread) as it is forbidden to eat any leavened food during the seven days of Passover. In Morocco, the day after Passover, the Jews hold a festival called Mimouna, which marks the start of spring and a return to eating chametz. Perhaps the best known spring flower tradition is the Japanese one of hanami (“flower viewing”) – taking time to admire the transient beauty of cherry blossom (sakura) or plum blossom (ume). There is an official cherry blossom forecast every year, announced by the Japan Weather Bureau, and picnic parties are held under the trees. The tradition has been going strong in Japan for many centuries, and many haiku have been written about it. Maybe your pupils could write one too? Perhaps we should also mention here the daffodil, national flower emblem of Wales and the subject of a very famous Wordsworth poem. You can find more poems about spring (and flowers) on the Poetry Foundation website. In Bulgaria and neighbouring countries during the month of March, people exchange red and white woven yarn or dolls called a martenitsa. Towards the end of the month, when they see a stork, or a swallow, or a tree starting to bud, they take off the martenitsa and hang it on a tree. Read more about this spring tradition on Wikipedia. 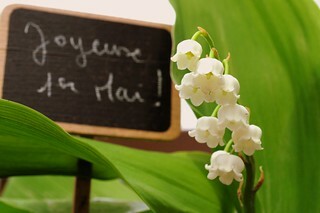 In France, the first of May is a holiday for International Workers’ Day, but there is also a tradition of giving your loved ones a bunch of beautifully perfumed lily-of-the-valley as a token of luck and affection. Finally, the Persian festival of Nowruz, which is celebrated on the vernal equinox, could be said to bring all these traditions together into one big celebration. It has its roots in Zoroastrianism, one of the world’s most ancient religions, but is also seen as a secular festival as well as being celebrated by the Baha’i faith and certain branches of Islam. A major spring-clean is done before Nowruz, people jump over bonfires, buy flowers such as tulips and hyacinths and prepare a festive table known as Haft Seen (‘seven S’s’). 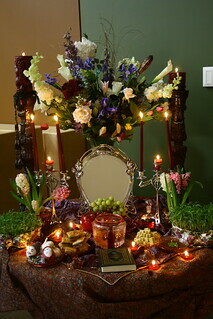 This table features traditional items such as eggs (signifying fertility), a mirror (signifying creation) and a goldfish (signifying life), plus at least seven items beginning with the Farsi letter S.
What would your pupils display on a table to celebrate the spring? The photo at the top of the page is Cherry Blossoms by Jeff Kubina on Flickr and used under a Creative Commons licence. These resources will help learners understand different versions of the Golden Rule, that we should treat others and the planet how we wish to be treated, and what that means for our own lives. Ocean Commotion is a full set of teaching and musical resources for a catchy environmental musical that encourages everyone to care for our amazing oceans. Commissioned by WWF, this resource is a fun way of sharing an environmental message. Ebrottié is a cocoa farmer in Côte d’Ivoire. He is part of a Fairtrade certified cooperative. This interview transcript forms the basis of a French reading comprehension, in which Ebrottié describes the challenges of life in a cocoa farming community. Think Global worked with RNIB to update and develop resources for the ‘Dots Raise Lots’ campaign, designed to help young people and schools learn more about sight loss and help spread awareness of the value of braille as a reading method for blind and partially sighted people. These resources were produced for the Global Learning Programme (GLP), England, to assist teachers with lesson planning during Fairtrade Fortnight. These resources were produced for the Global Learning Programme (GLP), England, to assist teachers with lesson planning around the FIFA Women’s Football World Cup 2015. These resources were produced for the Global Learning Programme (GLP), England, to assist teachers with lesson planning around the Rugby world cup 2015. These resources were produced for the Global Learning Programme (GLP), England, to assist teachers with lesson planning around the Olympics and Paralympics. These resources were produced for the Global Learning Programme (GLP), England, to assist teachers with lesson planning on the UK elections and EU referendum. These resources were produced for the Global Learning Programme (GLP), England, to assist teachers with lesson planning for the World’s Largest Lesson. These resources were produced for the Global Learning Programme (GLP), England, to assist teachers with lesson planning on the Sustainable Development Goal’s and the World’s Largest Lesson. These resources were produced for the Global Learning Programme (GLP), England, to assist teachers with lesson planning to support Send my friend to school activities. © Reboot the Future 2019. All rights reserved. Website design & management by Square Eye Ltd.